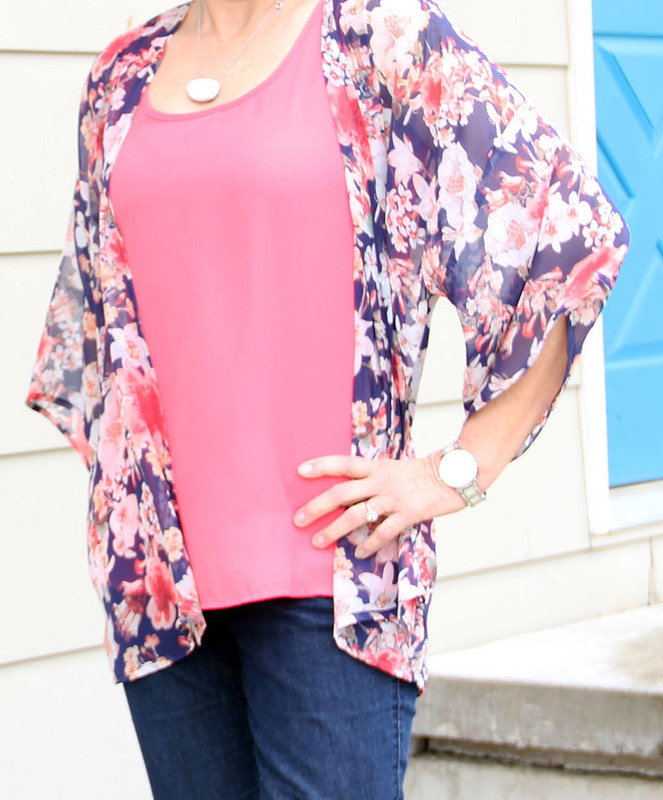 Floral Florence Kimono.....say that three times fast! 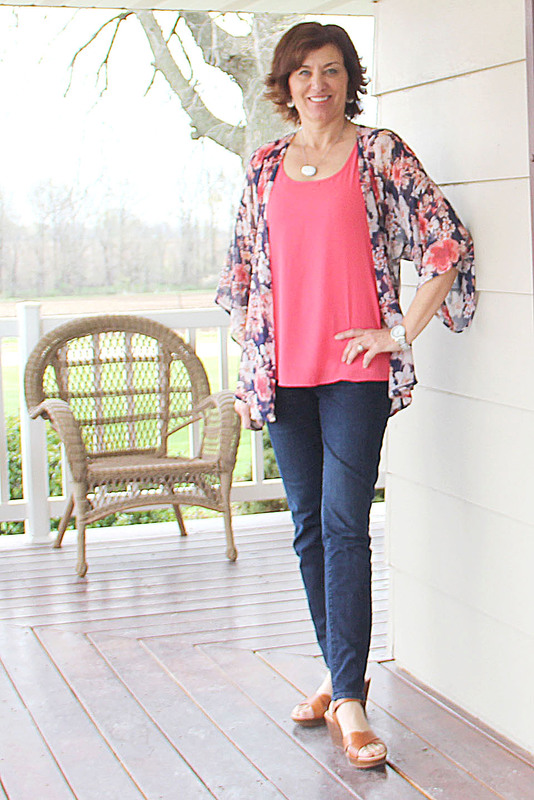 However you say it, I know what I say, I love this kimono top so much! It is just so fun with a bit of boho chic trend. 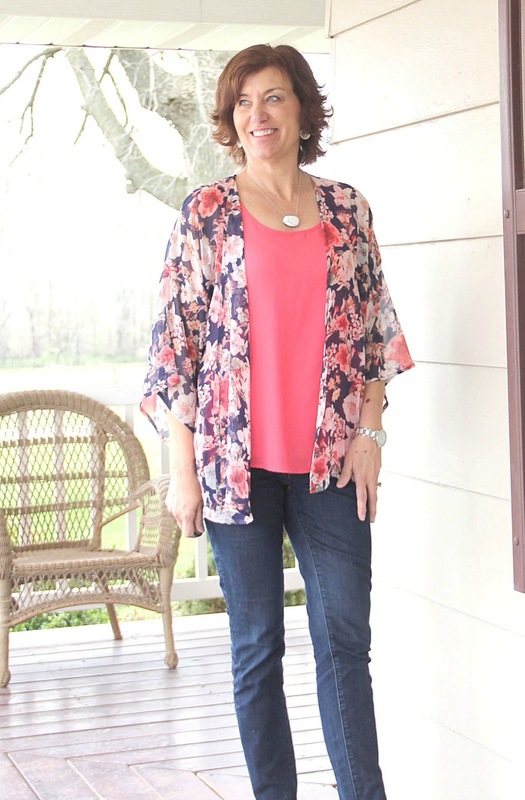 The pattern is from IndieSew, the Florence Kimono by Sew Caroline and it just a perfect spring topper. 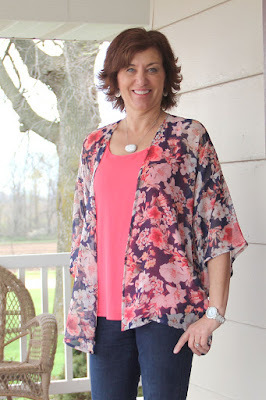 The fabric is Style Maker Fabrics' Polyester Chiffon Floral Print and when I saw it on Michelle's site the colors reminded me of a top I saw on Pinterest. The fabric went right into my cart, along with several other ones. When the box arrived, Meredith was right there helping me to open the box. While pulling out this chiffon, I commented what should I make? Meredith quickly answered a kimono top. She was so right, the chiffon is perfect for a trendy kimono top and I knew the Florence Kimono would be perfect. I printed the pattern right off and went to work. The pdf is easy to put together and the Florence Kimono is a quick sew, which is even more satisfying. Meredith mentioned something about wanting to borrow this kimono. With this in mind, my measurements are closer to a medium but Meredith is a small, so I compromised and cut the pattern out between the small and medium. I think the fit is just right for the style. All the seams are sewn with a French seams and I made one change to the pattern instructions. I did not use the pattern piece for the front band, instead I turned the front under twice and stitched. I mentioned to Meredith how many tops I had that would go with this kimono and started to name the colors. She replied, me, too and she added a couple more! Isn't she just too funny? I am anxious to see in which closet MY kimono ends up the most. Disclosure - I was provided the pattern as a part of the Indiesew blogger team but the opinions are all mine. Looks gorgeous Lori - I'm not surprised Meredith wants to steal it! It looks perfect for layering in spring & summer. 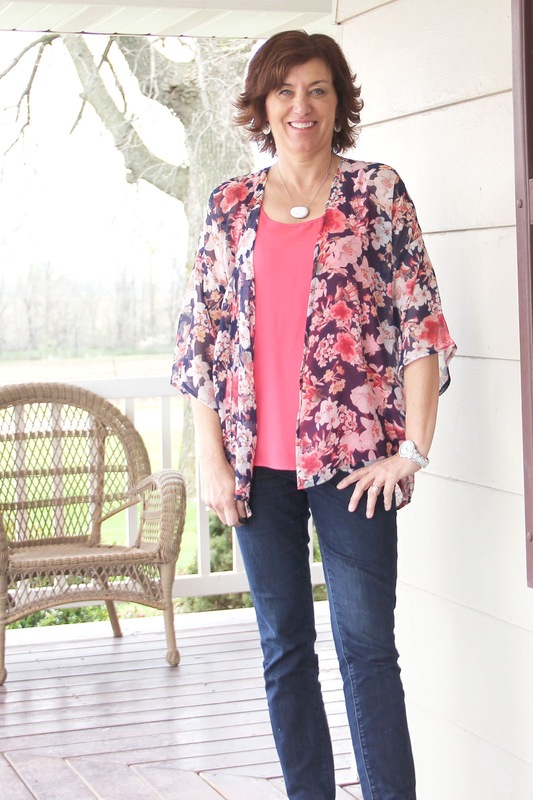 Thank you, Rachel, I love this kimono. Nice kimono! I have one of these on my list to sew also! Thanks, Carolyn, it is fun and quick to sew. Very pretty, Lori! I love the colors. I can see you will need to make a second one, as Meredith will surely win this one! Thanks, Ann, I am sure I will be making another one for sure. So pretty! I'm currently on the hunt for a good kimono pattern. I never buy indie though. It's gorgeous! I love the blazer you showed yesterday too! Thanks, Mary Sarah, I love both of these new garments, too. In fact, wearing the blazer today. We can be twins! It is the perfect fabric for this garment. Have fun making yours. 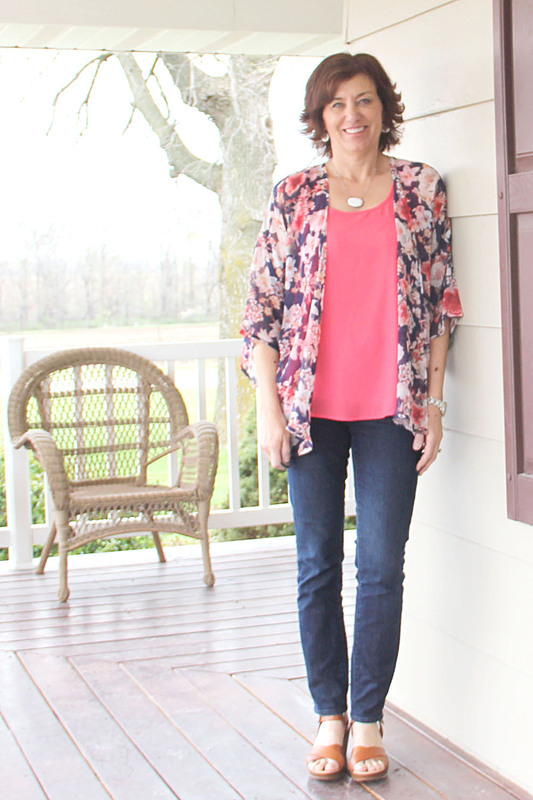 Love this kimono. The fabric is so pretty and the colors are beautiful. Looks great on you! Thanks, so much, I love this garment. thanks, Joen, I love the colors, too. Love this Lori! I have been making some kimonos with a self drafted pattern but I'm liking the fit of this on you...might have to invest!! Very pretty! It definitely will go well with many different colors. BEAUTIFUL kimono! And your shoes are perfect with your outfit. I swear I had them in college, and loved them to death! Where did you get them? Do tell!